Dyvooo helps you to take care of your dearest women. The next 12 months they will be under the defense of our Wonderdog. It’s a symbol of the next year so it will be a brilliant idea to present such unique gift to mother, sister, granny or girlfriend with the sincerest wishes to them. The women’s T-Shirt with Wonderdog is a universal thing. It will highlight her out of the crowd during weekdays or holidays. The full production cycle is concentrated in Ukraine. The special technology of printing saves the brightness of colours even after hundreds of laundries. Dyvooo sends you clothes in a colourful package which increases the gift’s value. 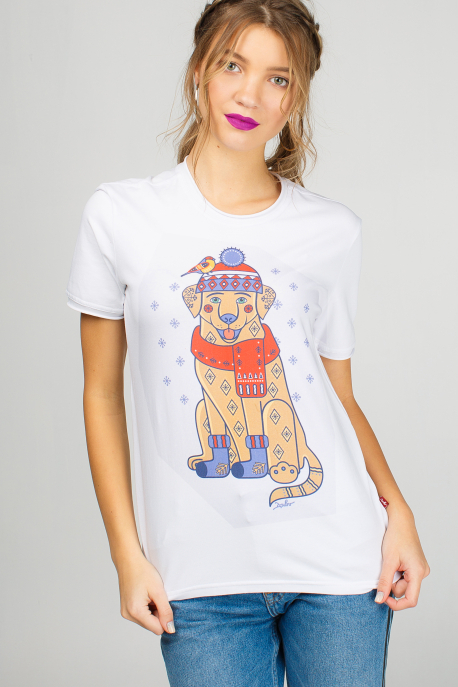 The women’s sweatshirt "Christmas Labrador"